Step 1: First you’ll create a triangle for one side of the bracelet using the brick stitch. Step 2: You’ll now start the second row. Go up through the second bead in row 2. String 2 hex beads, and like before, go through the thread loop between the two beads on row 2. Step 6: String another hex bead and go through same thread loop that you just went through but pick it up on the other side of the bead you just added. Step 11: Continue in this fashion until you have 7 rows. Basically, you will always start a new row by adding two hex beads. When you get to the last thread loop, you will be adding two hex beads, one after the other, to that loop. In the middle of a row, you simply add a single hex bead to each thread loop. Step 12: Set this triangle aside. You will use it after you’ve created a second triangle. To create the second triangle, thread your needle with 3 yards. String 2 hex beads and bring them down the length of the thread until you have about 1 yard left. Tie the hex beads together like you did in Step 1. Use this short, 1-yard thread to create the next triangle. Follow the instructions for Steps 1 to 11. You will use the remaining 2 yards of thread for the interior pearl net. You can start with less thread if you want but I hate adding thread so this works better for me. Step 14: String 3 seed beads and a pearl. Continue to add sets of 3 seed beads and a pearl until your bracelet is the length you want it, minus about 1.5 inches and the length of your clasp. Step 15: String 3 seed beads and go down through the first pearl. String 3 seed beads, a pearl and 3 more seed beads. Go down through the third pearl from the top. String 3 seed beads, a pearl and 3 more seed beads. Go down through the fifth pearl from the top. Step 16: String 3 seed beads, a pearl and 3 more seed beads. Skip a pearl and go up through the next one (the second pearl in the second row of pearls and seed beads you added in the last step). String 3 seed beads, a pearl and 3 more seed beads. 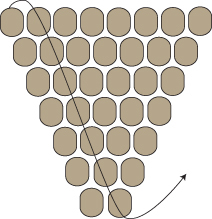 Skip a pearl and go up through the next one (the fourth pearl). Step 17: Repeat Step 15 but go down through the fourth bead in the second triangle, weave inside the second triangle, and exit out of the fifth bead of the second triangle. Step 18: Repeat Step 16 but go up through the fifth bead in the first triangle, weave inside the first triangle, and exit out of the sixth bead of the first triangle. Step 19: Repeat Step 15 but go down through the sixth bead in the second triangle, weave inside the second triangle, and exit out of the seventh bead of the second triangle. Step 20: Repeat Step 16 but go up through the seventh bead in the first triangle, weave inside the first triangle, and exit out of the eighth bead of the first triangle. I usually weave my way around the triangle and go back through the clasp twice. I also go back into the net weave and knot once (because it’s easier to knot in the net than in the triangle). After you’ve clasped both ends, get rid of excess thread by weaving it inside the triangles. 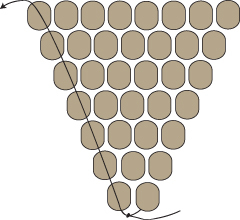 Knot (which is easier to do at the edge of the triangle) and cut the thread tails.